In 2000 Kristen Barker was independently contracting occupational therapy services in public schools. Through her work, she quickly recognized there was a need for outpatient services for children, and by 2001, she and co-founder Tommy Mathena established the Center for Pediatric Therapies (CPT) in Danville. Then, as the center experienced rapid growth, they expanded, opening additional locations in Lynchburg, Martinsville and South Boston. Many of their patients have conditions such as autism, cerebral palsy, sensory processing disorder, genetic disorders and developmental delays. “We really do see a variety,” said Barker, CPT executive director. With 55 employees between all of their locations, they currently serve over 1,000 patients. “We have occupational, physical and speech therapy,” said Barker. Speech Therapy aids children in developing their language and communication skills that are essential for social, academic and functional communication. “Language is about talking, expression, and if the child is non-verbal, they may work on sign language, (or) they may work on using a device,” Barker said. Some of the communication disorders they work with are dysarthria, apraxia, feeding disorders, voice disorders, fluency disorders, articulations and phonology disorders, brain injuries and autism. “They’re going to focus on language and the child’s ability to communicate, as well as the area of feeding—quite often especially children who are born premature and have had a lot of traumatic events at birth, being in the NICU, and all the wires and tubes,” Barker explained. These kinds of events can cause a child to develop an intolerance to different types of foods and textures. Occupational Therapy is designed to help children develop age appropriate skills they need to navigate everyday life. “Can the child dress themselves, bathe themselves, brush their teeth? Can they feed themselves?” Barker said. They focus on fine motor tasks such as tying shoes, and working buttons and zippers. Additionally, they focus on how to improve sensory information processing, increase attention, and improve handwriting. Physical Therapy (PT) helps children with coordination, strength and endurance. 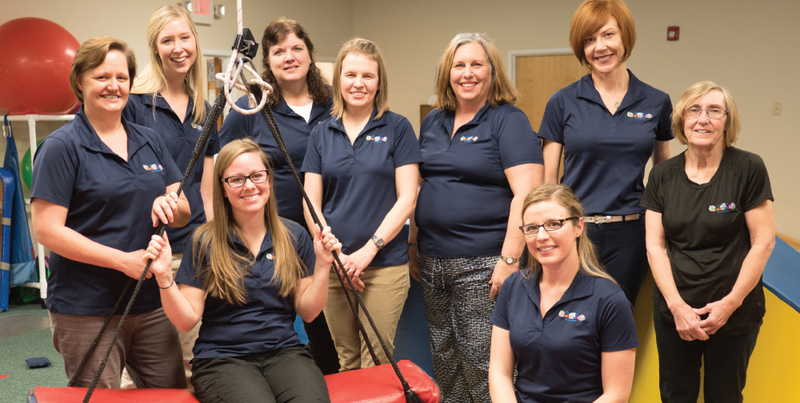 PT is offered to children with conditions such as autism, central nervous system problems, cerebral palsy, congenital disabilities, gross motor development delays, head injuries, muscular dystrophy, torticollis, and others. Lane’s son has been diagnosed with High Functioning Autism, Sensory Processing Disorder, and a feeding disorder. The eight-year-old is currently receiving occupational, speech and feeding therapies. Barker’s passion for providing pediatric therapy has turned into a mission that has fulfilled a need in our region. “We are the only purely pediatric provider [in the area],” Barker said. “What is special and unique about our agency is all of our therapists specialize in pediatrics.” Other agencies in the area also offer services for adults. Recognizing there were additional services needed for children with autism, they decided to open a private day school in 2004, specifically for children ages two through 14. Building Blocks Center for Children with Autism, in Danville, is a fully licensed and accredited day school with 17 students currently enrolled. According to the Centers for Disease Control and Prevention, nearly one in 68 children have been identified with autism spectrum disorder (ASD). “The statistics show that it’s been a very rapidly growing area in the world of pediatric diagnosis,” Barker said. To be treated at CPT, a referral from a physician or a case manager is typically required. If you are concerned about your child’s behavior, she recommends seeing the child’s doctor. Although some issues are seen or developed later in childhood, there are issues that can arise early on. CPT appreciates their dedicated employees and patients, and in celebration of their 15-year anniversary, they hosted two events last September. Aside from a dinner and party for the staff, they invited all the former and current patients to participate in a family day at their science center in the Danville location. “They were able to participate in not only the activities of the science center, but our staff also had special activities set up for children and families as well,” Barker said. With over 100 in attendance, they were pleased with the turnout, and grateful for the opportunity to thank their current and past patients for their investment in the center.